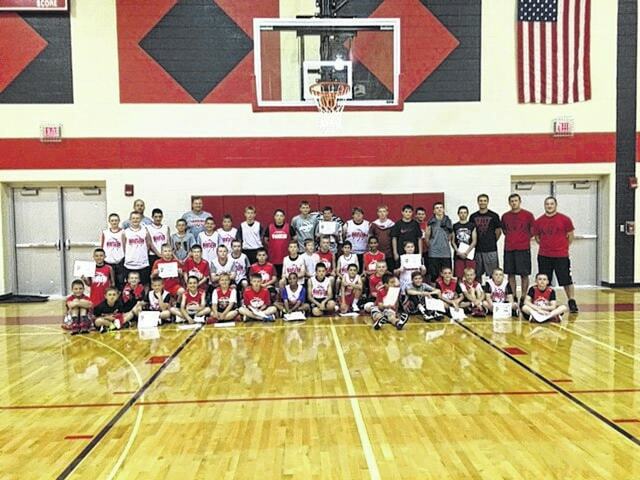 Wauseon varsity basketball coaches and those students, grades 5 through 8, who attended their camp gather for a photo. The Wauseon Boys Basketball staff recently held a camp for incoming Wauseon students grades 5 through 8 at the Wauseon Middle School. The camp was a 3 day event and had more than 50 boys attend. Contest winners included 5th graders Martin Shannon, Jude Armstrong, Reece Nation, Jackson Gleckler, Ethan Borton, Avery Coronado, Eli Delgado, Lukas Rotroff and Zaidan Kessler. The 6th grade contest winners were Logyn Batdorf, Krue Powers, Carson Burt, Jonas Tester, Deacon Laney and Braden Chittum. The 7th Grade contest winners were Jacob Hageman, Kolton DeGroff, Ayden Cheney, Easton Delgado and Luke Wheeler. In 8th grade, contest winners included Jared Richer, Shane Nofziger, Sean Brock, Hunter Nofziger and Owen King.